The big move(s). | House by the water. 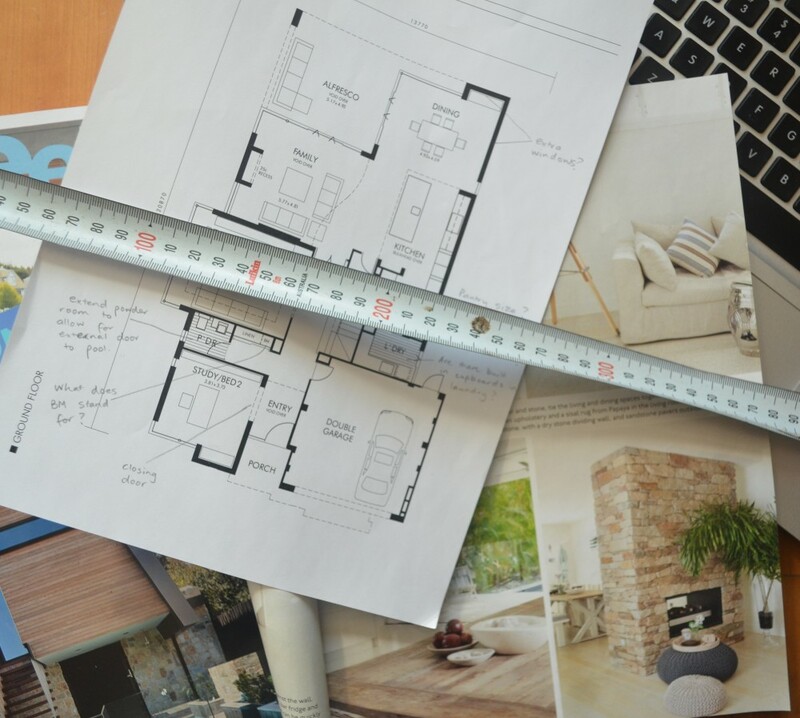 Orchestrating the construction of a house from overseas has been relatively easy. When you hire a volume builder, part of what you pay for is the project management. 10-15 years ago it would have been a different story. Most items can be viewed online these days and most people can be contacted by email. Our requirement to “be there” really only involved one visit for “pre-start selections” – checking out the tile, lighting and internal fittings in person before making selections. This end of the process, as we are nearing house completion (and I use the term “nearing” loosely), is a bit awkward. The non-binery date for completion makes the logistics of returning back to Australia kind of tricky. I won’t harp on the issue of short-term accommodation again, but I do want to mention local storage. Our furniture will be packed up this week, some of it destined for a plane ride to Western Australia but most of it will go on a long, slow trip on a ship. And for once, the incomprehensibly long process of exporting and importing our goods may actually be in our favour, saving us storage fees in Australia. But this post is inspired by another aspect of our move. It’s a kind of ode to my parents, and all parents in Australia who have strapped beds, tables, refrigerators, sofas, etc., onto a trailer and driven hundreds of kilometres to “help the kids move”. My parents have been doing this for over 20 years. With my sisters located in Sydney and Melbourne, they know the Hume Highway like the back of their hands. When we unexpectedly moved overseas 4 years ago, we’d just recently bought a new camper trailer and we didn’t want to sell it. Similarly, we needed to buy a car in Australia 2 years ago to tow the van for a couple of months. Buying and selling cars all the time is irritating, so we decided to keep that too. My parents have kindly kept our van and car for us in their garage all this time. So as we plan our intercontinental move (5 flights, 48 hours, 3 kids, oh, the pleasure!) my Mum and Dad are planning a cross-continental move. 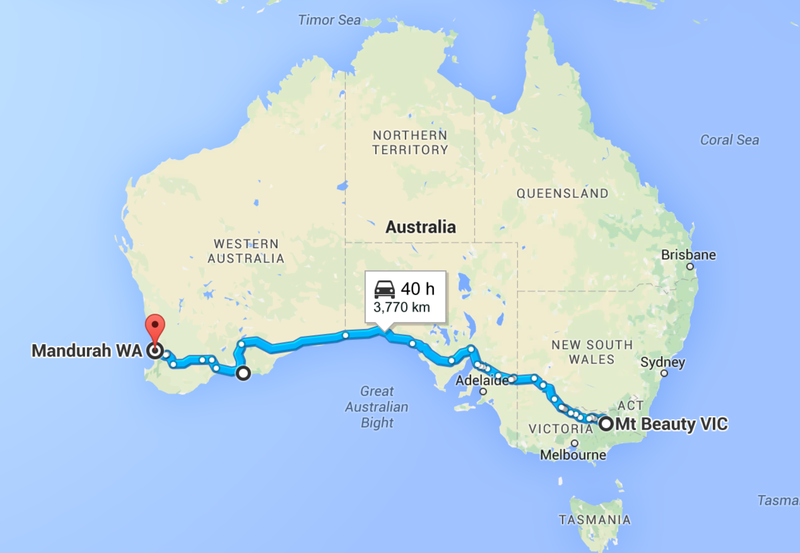 They’ll drive our car and van across the Nullarbor (5 days? 48 driving hours? No kids, phew.) If that’s not dedication enough, my Mum has also packed all the things we’ve left or had delivered to their house over the last few years. Travel souvenirs, gifts intended for the new house, kids Christmas presents that didn’t fit in suitcases, material won as a prize and a few purchased items for the house that I couldn’t resist buying early when they were on sale. Google maps version of the route from my parent’s house to House By The Water. In reality, my parents will take the more scenic route. Our trip: São Luis, Brazil to House By The Water in Mandurah. thanks for adding “removalists” to your already long-list of occupations. Thanks Jane. I can’t wait! At least for the next few days, they’ll be driving against the ‘West Coast Eagles Supporter Convoy’ which is currently making a beeline for the MCG. But come Monday of next week there could be LOTS of company on the road as the Supporters make their way back West. Happy travels to you all! True Sarah! My parents will be onto that and will no doubt find somewhere to hibernate for a day or two after the weekend. I remember trying to buy a plane ticket for Maria and Con’s wedding one grand final weekend. Impossible. The next big move is not that far away, are you getting excited yet or has that all been overcome by the thought of that really long flight with the kids in tow. It will be great to catch up with you guys again, it’s been awhile. Definitely excited, Harry. It’s a long trip, but we are not slumming it on this occasion, so don’t feel sorry for us. I’ve been envisioning the welcome glass of champagne as I sit on the Qantas plane in Santiago for a long time. See you soon! That’s a lot of miles! I can relate to the storage dilemma, though my situation isn’t as stressful as yours. I have lots of stuff stored with my parents too, and like yours they wouldn’t hesitate to drive cross country for me. Bless! Have your parents returned from their travels with your camera yet Trixee? Unfortunately no, but my phone camera seems to be coping OK at the moment. I still need to work on figuring out how to use our DSLR though! Good luck with the countdown Johanne between packing, leaving parties and last minute sight seeing you will be busy, busy, busy. Oh and let’s not forget cleaning the rental too 🙂 I am currently starting our rental deep clean by hoovering swag pelmets and washing venetian blinds – oh joy! I hope you have professional packers and cleaners on hand to help. Thanks Lunar. My new strategy for cleaning our apartment is to leave everything (more or less) until the house is empty, then go through it like a 2 day hurricane. Pre-cleaning in this household only means doing things twice. Hope it works! Progress report: 650 km today. Lucky to get the Last site in Mildura Caravan Park. We have already been invited to free sausage sizzle and Country and Western Band by the BBQ tonight …by very friendly grey head nomads. We haven’t seen a car load of Wesr Coast Footie supporters yet but there will be lots tomorrow I’m guessing. Enjoy the bubbles – I am sure you will be wanting more than one glass after all your packing and prep. Thanks Deb. It will only take one glass! Aren’t parents just the best!! Looks like your parents live near us :-). Best wishes with coordinating your move Joh. Thanks Anthea. I just caught up on your build. It looks so good! Are you in N.E. Victoria? Day 2: another 650km. We are camped beside a railway line in Port Augusta. Today we drove for 8 hours with failed wheat crops most of the way, no rain for the farmers. Wildlife for any non Aussies, hundreds of emus eating what was left of the wheat. 35C today. Prado and van cruising along nicely. Good luck with your journey it sounds like a real challenge. Hope the house will be as you pictured it so far. Thank you Jayne. I can’t wait to get on the Mandurah waters again, as per your latest blog post! Adelaide is home but I type this from Manhattan tonight part way through a three week round the world work trip. I’m curious, what is the more scenic route from Mt Beauty to Mandurah? Short of detouring via the Northern Territory? Ha ha! There is no getting around the Nullarbor, but once in W.A. it is nice to head South to Esperance then follow the coast around to Mandurah. It’s slow but the beaches, forests and wines are worth it. 2000k+ into the trip. The Nullarbor is never boring. We saw whales today, a mum feeding her calf. Sometimes the long straight road across the Nullarbor plain comes very close to the coast. A brief detour down a sandy track took us to the edge of our continent and there they were, whales, lolling around in the Great Australian Bight. 3000k + and another reward after crossing the Nullarbor. Esperance, a beautiful town on spectacular coast. I will finish my travelogue with this comment. If you are in the area, don’t miss Esperance. And an update for Johanne: the house treasures are travelling well, every cubby hole in the van has something lovely for the house. The parents are travelling well too. Very good. There could be all sorts of surprises in that van. Where would we be without parents?! My mum currently is acting as storage for us as well. Safe travels to your parents. Bon voyage Johanne! Hope it all goes smoothly. And yes, parents are the best, aren’t they? Mine are celebrating me having a house and finally moving out all of my last things from their place. I’ve never seen The House of Cards Bruna, but I’ll assume your comment is a compliment. See you in the “hood” sometime soon. Great blog and precious tips! Thanks!